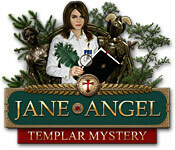 Jane Angel: Templar Mystery is rated 3.7 out of 5 by 11. Rated 5 out of 5 by rosekaufmann from Scrollable Game A refreshing change from the dark, dank scenery found in so many games. Read Rescue_helo's review for details of how the game works. With the beautiful graphics and well defined objects in the scrollable HOS scenes, this is a very enjoyable game. The hints system is very helpful in finding that last item that's just too well hidden and they quickly recharge. Very well developed story. 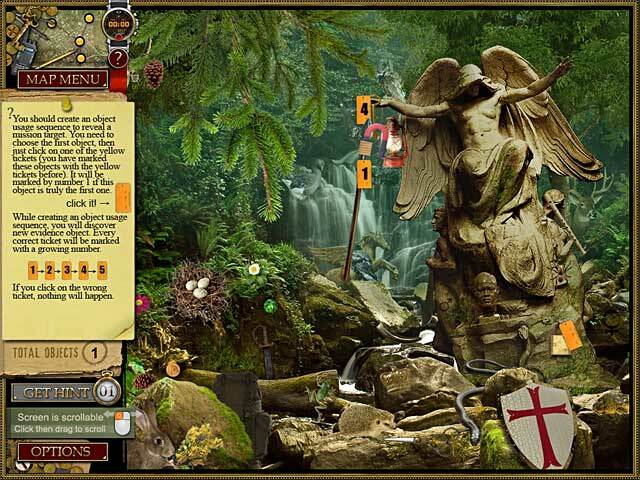 Rated 5 out of 5 by lisabroken from mystery hidden object myistery hidden object ilike to play this.......csz its very beautiful anexcitement.specially you forget the all problem,when you play this game. Rated 4 out of 5 by fredandethel from Something a bit different, try it and see! Not a game I had to buy as soon as the trial hour was up, but having eventually bought it and finished it I've started to play it again almost immediately - that must prove something! There are some different objects to find from the first time round - always a plus, mini games are original,and the whole way the game works is not like any I've come across before. 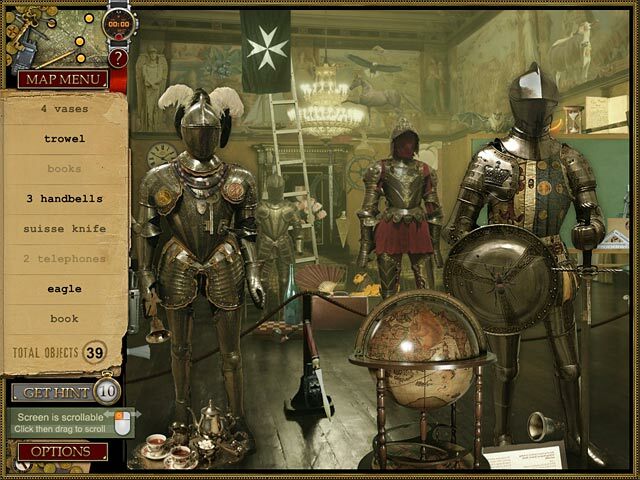 Rated 4 out of 5 by otis55 from I love the Templars This game isn't extremely difficult but is challenging. The mim-games are different from others I have played and a lot of fun. The Hidden Objects are spread out and not on top of each other, or so small you can't find them. I love everything about the Templars and the storyline is not outlandish. I would recommend this game for everyone!!!!!! Rated 4 out of 5 by Tassiegal from Enjoyable game This was one of the first Big Fish games I bought - I'm a sucker for anything to do with the Templars and the Holy Grail. I've played this game several times and still enjoy it. I like the scrollable HOS and mini-games. For me, games are a relaxation and I don't want a high level of challenge - this game fits the bill nicely. Storyline is OK and I liked the historical tidbits of info. The so-called Scottish aristocrats didn't look remotely Scottish but that was just a rather cute quirk to me. I quite liked the graphics and way the story was presented. One plus with this game is that the HOS and other scenes are bright. Like several other reviewers, I very much dislike the dark and dismal games which are so prevalent these days. I usually turn the sound down or off so can't make a valid comment about it. If you are attracted by the subject matter it's worth downloading the trial but I can see that some people might get bored by the level of challenge in the game. It's great that BFG has such a wide variety of games for all tastes! Rated 3 out of 5 by BirdLover89 from Didn't finish This game was pretty boring, although not so boring that I wouldn't have finished it had I not gotten to a game that I could not figure out and could not skip. Since there is no walkthrough, I just discontinued the game. The game did have pretty scenery and most of the games were quite fun to do. Too bad I couldn't finish it. As for the misspelled words and some of the HOs not being labeled correctly, that was no big problem for me. I am willing to work with game makers with different languages than mine. Rated 3 out of 5 by GracePiranha from It could have been so good, but . . . It is a real shame that this game isn't wonderful. The graphics are beautiful, the hidden objects challenging, but . . .this is very cumbersome to play. If you run out of time on a level, you have to go back too far to restart. I'm an editor so I admit to grammar snobbery, but some of the errors in the story copy are egregious. Also, the characters are pretty lame. Rated 3 out of 5 by Rescue_helo from A Mega HOG Just consider a game made almost entirely of scrollable, heavily populated HO Scenes in which you have to find no less than 30 items [or more] in each of them. This is exactly what Templar Mystery offers you. 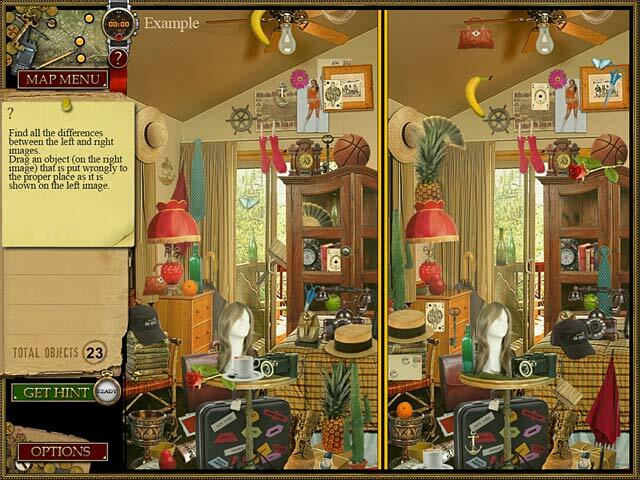 No adventure, rare puzzles, one minigame in 50 minutes of the demo and a couple of original features: - #1: instead of simply finding the differences, you have to locate where the items are misplaced and replace them in the window on the right half of the screen as per the example given in the window on the left. - #2: at the end of certain locations, you need to create and object sequence in order to obtain additional evidence objects; the idea is to give the correct number to each of the yellow tags..... yes, I know, it's a bit difficult to grasp at first... LOL The sceneries in Chapter 1 are just photos; you start at LAX [L.A. Airport - baggage claim section] and this is the first HOS filled to the brim with all kinds of objects, which are given in a list that fills up as you eliminate items. This, to me, seemed like it would last forever. Hints recharge fast, thank Goodness, but the cursor is a..... noisy brat. Each time you misclick you hear a "bang", faintly at first, but it gets louder and louder with every additional misclick ! I had to mute my speakers; no big deal because you do have sound effects, which are another annoyance, but no voice-over [all cutscenes are scripted], and the in-game music is not worth remembering, save for Beethoven's Moonlight Sonata. The only feature I really appreciated is the background to the story: - the intro gives a summary of the history of the Knights Templar Order, how it was founded, what its objectives were [eg: the Holy Grail] and how it was persecuted by the King of France, jealous of its wealth; we learn a little bit about the Crusades, too, as well as, later in the game, about Columbus, his supposed link with the Order and how the surviving Knights would have reached America via an old Viking route. Jane starts her own quest to find the Holy Grail, as the legend has it the Knights would have hidden it on the american continent....or maybe in Scotland..... Needless to say this is not enough to induce me to buy this game; I quit at end of Chapter 1, there are simply too many HO Scenes for me and each one is much too long. If you are a fun of the genre, this game stands a good chance to make you happy.